Who would’ve thunk? Then again, if you want to encourage patent peace, there is no better way to do it than get into bed together and commingle DNA, which is just what Apple + Google are doing. The two tech titans have jointly submitted a more than $500 million bid for Kodak’s patent portfolio. Rochester, New York’s Eastman Kodak is in bankruptcy and they’ve arranged for $830 million in exit financing with the stipulation that the company gets at least $500 million for its patent portfolio. 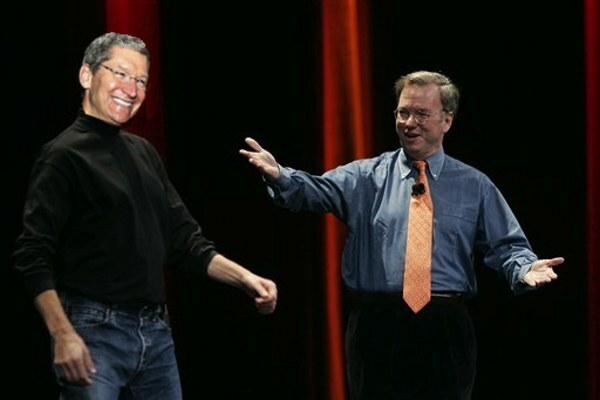 Enter an unlikely couple — Apple + Google — which has offered that much and apparently a bit more. A case of necessity or opposites attract or perhaps both? Although Apple and Google have yet to face off in court, the iPhone maker has taken many of searchzilla’s Android smartphone partners to court, settling with HTC while pressing its fight with Samsung. That said, Apple and Google getting a room and then bidding on Kodak’s patent portfolio might not seem an obvious move. However, according to Bloomberg, unlikely partnerships are typical in patent sales because they allow competitors to neutralize potential infringement litigation. A fine example of this is the Apple + Microsoft + Research in Motion (RIM) partnership that purchased more than 6,000 patents from defunct telecom equipment maker Nortel. Thereafter it became known that Microsoft and Apple had inked a cross-licensing deal covering the iPhone and Windows Phone, as well as who knows what.